Several reasons why this driver may suit; it is fairly sensitive, it goes down to 25hz f3, it needs a big cabinet and the basket looks alot nicer than the cone! Main question is, if front facing with floor gain, where roughly would I need to cross? I'd say when the distance between the bottom of the cones is 1/4 wavelength, you'll need to crossover. That's assuming, of course, that the effects of the basket and magnetic structure is negligible. Thanks Chris for answering. Would you say a 250 hz crossover is doable? I'd expect 250Hz to be fine. An alternative would be to use isobaric loading, but not in a clamshell arrangement. You could then roll off the inside woofer and let the outer one radiate as high as you like. Hey that's interesting, never heard of that approach. 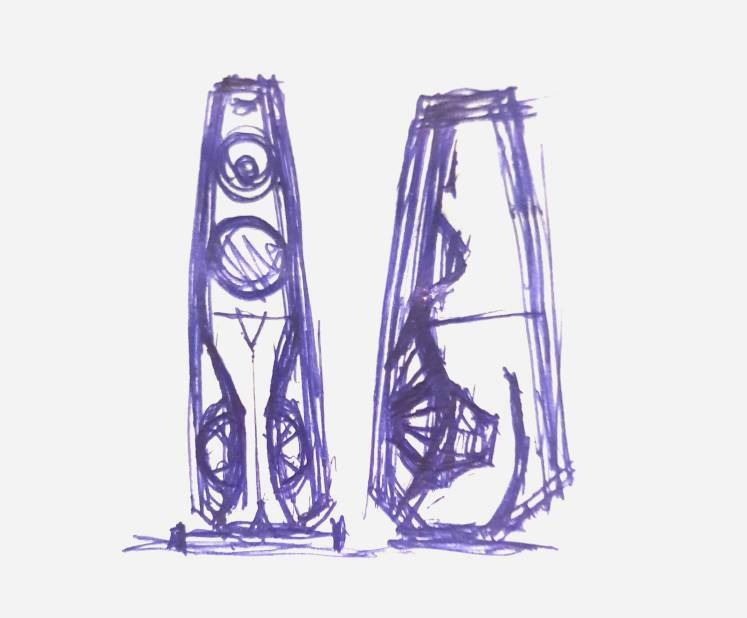 Is that something Wilson Benesch or Linn have done? Yes. That's the configuration used in the Linn Isobarik and Sara. An expensive way of reducing box volume requirements. Terrible sketch but this is kind of how it would be. A 3 way with the clamshell recessed slightly into the cab. I want the baffle to continue down and over the front of the bass driver magnet, with enough of a gap to install the two bass drivers. Then the down firing port would run down the back of the cab. I've never figured out the drive behind using an isobaric configuration. Sure you get 1/2 the volume for the rear enclosure, plus the volume of the isobaric chamber so it's not really 1/2 the total volume. It is, on the other hand, 3dB less efficient, whether you connect the drivers in series or parallel. makes more sense just to find a driver with the same Fs, Qms, Qes, 1/2 the Vas. You will have truly 1/2 the box volume and the same 3dB lower efficiency. Just mount a 10 or 12 on the side...Qtc up to 1 or so for a sealed is fine, and a sealed with Fc ~35 goes a lot deeper than you think. Venting any small box tuned low is problematic. You can get a lot of driver for $400 that will work better in the application.